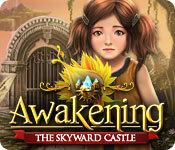 Our Awakening The Skyward Castle Walkthrough will accompany you on your long journey as you guide Princess Sophia in this fourth installment of the Awakening games. Use our handy tips, detailed chapter-by-chapter instructions, and hundreds of custom screenshots, each clearly marked with key item locations and puzzle solutions, to help you battle the evil Dreadmyre and save the people of the Skyward Castle. Well, I have to hand it to the game developers... they have certainly kept us busy here at CGG with the slew of exceptional games that have been released in the last few weeks. I feel like we've done nothing but eat, sleep, and dream walkthroughs lately. We barely finish up a few, and then I look and see that we need to start a bunch more! It's certainly been an exciting and fast-paced time for us... I mean... so many games to play and so little time to play them! Out of all the games that I've played lately, I have to say that Awakening The Skyward Castle has been, by far, my favorite. It was just honestly one of the most gorgeous games I've seen in a long time, paired with a wonderfully enchanting story that had me fully immersed from the moment gameplay began. That's why it was with great relish that I tackled the Awakening The Skyward Castle Walkthrough. I waded through all four incredibly long chapters and filled the walkthrough with everything you'll need to know to beat the game, including item locations for all hidden object scenes as well as solutions to each and every puzzle. There's also literally hundreds of screenshots to help you through each chapter in case you find yourself lost or unsure of what to do next. The Awakening The Skyward Castle Walkthrough was definitely a labor of love and I hope that you'll find some use for it. Use it as a handy guide for whenever you need some assistance with a particularly perplexing puzzle, such as that somewhat annoying map puzzle, or just hang on to it as a constant companion as you journey through the Skyward Castle in search of Sophia's parents and the notoriously evil Dreadmyre.